Professor Carver (Stuart Hamblen), an archeologist engaged in the excavation of an ancient pre-Columbian tower deep inside a state-forest region, has discovered that there are many other towers in the vicinity, most of them now buried beneath modern dwellings. Since these towers hold a valuable secret, the unscrupulous Professor sets out to acquire the land that contains them, using both trickery and outright violence to force the current title-holders into selling; all this skullduggery is performed by his henchman Spear (Anthony Warde) and other hired thugs, leaving the Professor himself unsuspected by Forest Ranger Steve King (Larry Thompson)–who, aided by local trading-post proprietress Marion Brennan (Helen Talbot), is determined to apprehend Spear’s gang and discovering the motive behind their criminal activities. 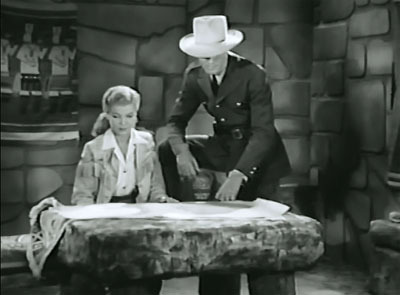 King of the Forest Rangers is the weakest of Republic’s generally excellent early post-war serials, being at once less colorful and less gripping than contemporaries like Daughter of Don Q or The Crimson Ghost. Part of the problem lies in its screenplay; though the idea of the ancient, mysterious, and treasure-bearing Indian towers is an excellent one, writers Basil Dickey, Albert DeMond, Jesse Duffy, and Lynn Perkins fail to develop it very effectively. The villains have already discovered the towers’ secret before the serial opens–thus stripping the towers of much of their mystery, and denying the audience a treasure-hunt subplot of the kind that enlivened the later and similar serial Dangers of the Canadian Mounted. Also, unlike the treasure cave in Dangers, the towers lack an atmosphere of ancient and mysterious danger; the tunnels and secret rooms beneath them are as safe as modern-day mine shafts, with no lethal prehistoric booby-traps to be found. One character does proclaim that Carver was destroyed by the “spirits of the Towers” in the final episode, but the villain has in fact been undone by his own modern explosives. Finally, the writers coyly avoid telling the audience what the valuable secret of the towers actually is, until the final episode; this gimmick is apparently intended to build suspense, but it actually has the opposite effect; it’s hard to get too involved in the hero-villain contest when we don’t even know what the stakes are. 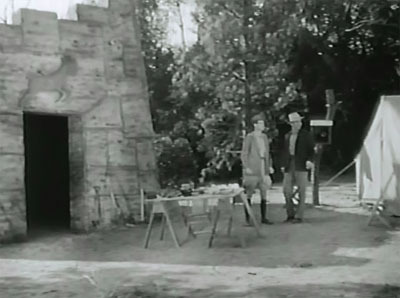 Above: Villains Tom Steele (light coat) and Stuart Hamblen outside one of the coveted towers. 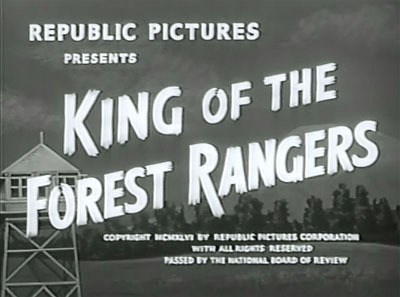 With the potentially interesting lost-treasure aspects of the plot thus deemphasized, the villains’ land-grabbing activities take center stage, basically turning Forest Rangers into a disguised Western, and a rather decaffeinated one at that–since its modern setting precludes the large-scale outlaw raids and mass shootouts typical of the “Western land-war” genre. Still, though the land war here is subdued, the writers do manage to keep it moderately interesting by varying the villains’ methods of seizing land; the heavies variously use poker-game chicanery, straightforward physical intimidation, and even a bogus haunting–a novel gimmick that should have been more thoroughly exploited, though it does lead to one memorably eerie sequence. The arrest and escape of Spear and the chapter-long investigation that follows provide a break from the land-theft plot in the serial’s first half, while the serial’s second half alternates land-grabbing with the increasingly curious King’s attempts to uncover the secret of the towers through impromptu archeological searches of his own–and the villains’ attempts to stop these enquiries. This latter subplot takes over the last three chapters of the serial, making them a good deal more exciting than the earlier episodes–and, incidentally, demonstrating how a central treasure-hunt theme could have improved Forest Rangers as a whole. Above: Helen Talbot and Larry Thompson finally discover the secret of the Towers. The action scenes in Forest Rangers are plentiful and dynamic, with director Spencer Bennet (Fred C. Brannon co-directs) staging one slam-bang, prop-tossing, furniture-destroying fight after another. Tom Steele and Dale Van Sickel double (respectively) hero Larry Thompson and chief henchman Anthony Warde throughout the serial, with Ken Terrell, Joe Yrigoyen, Eddie Parker, Bud Wolfe, Carey Loftin, Bud Geary, and Dave Sharpe all joining them for brawls in various episodes. 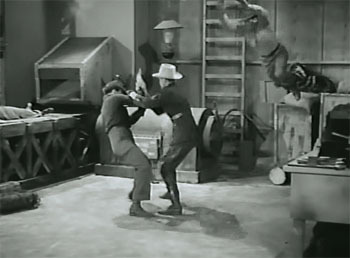 The trading-post fight in Chapter One (with Loftin and Van Sickel attacking Steele), the Chapter Four office fight between Steele and Van Sickel, the Chapter Seven Steele/Van Sickel fight that begins in a trading post and winds up in one of the underground tower rooms, the Chapter Nine fight at the wood-processing plant (Steele against Van Sickel and Terrell), and the last-chapter fight in Carver’s cavern headquarters (which has Sharpe doubling the evil professor) are among the highlights. Exhilarating and expertly-choreographed as all of these scenes–and many others–are, they’re so numerous and so essentially similar as to make the serial’s action seem more than a bit formulaic, a problem common to many of Bennet’s Republic serials. 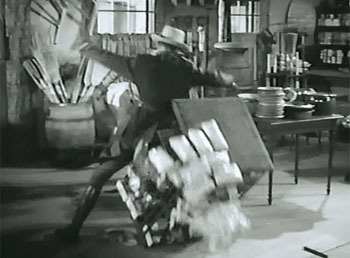 Above, top left: Van Sickel knocks Steele into a table, scattering trade goods during the Chapter One fight sequence. Top right: Van Sickel prepares to swing a chair at Steele during the Chapter Four office brawl. Bottom left: A shot from the Chapter Nine fight at the plant, with Van Sickel and Steele grappling as Ken Terrell makes a spectacular leap onto the latter. Bottom right: Steele sends Dave Sharpe flying through the air during the serial’s final fight sequence. 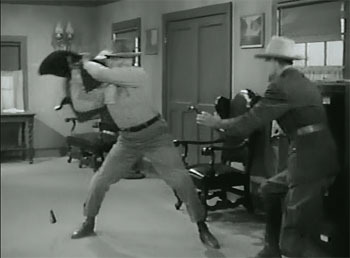 The serial’s innumerable indoor fistfights are supplemented by outdoor action scenes shot in the picturesquely wild-looking Big Bear region, within the San Bernardino National Forest. The relentless emphasis on set-bound fisticuffs prevents Bennet and Brannon from making as extensive and effective use of the Forest area as William Witney and John English did in the earlier King of the Royal Mounted; however, the periodic gunfights and chases that take place in the woods or on the lake are quite well-done. 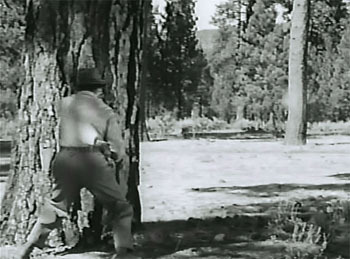 The shootout amid the trees at the end of Chapter Ten is particularly strong; the Chapter Seven mined-road sequence (during which the hero’s station wagon plunges down a steep slope) and the motorboat chases in Chapters One and Six are very good as well, while the pursuit through a fire-swept forest in Chapter Five features some good scenery and smoke effects–but relies a little too heavily and obviously on process-screen shots. Another action highlight is the lengthy shootout inside Republic’s cave set in Chapter Eleven, which leads into an excellent cliffhanger sequence (the villains tossing blazing brushwood down into a pit in which hero and heroine have taken shelter). 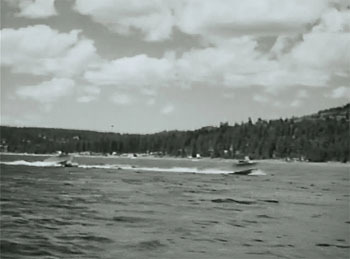 Above: Shots from the Chapter Six motorboat chase and the Chapter Ten forest shootout. Other memorable cliffhanger sequences include the Chapter Two ending (in which the hero is apparently skewered beneath a harrow), the Chapter Seven ending (which has the hero falling from a ladder into a fire-filled room), the ending of Chapter Nine (with the heroine menaced by the grinding teeth of a massive pulp-shredding machine), and the suspensefully built-up Chapter Ten ending (which has the heroine unwittingly running through a mine field and finally stumbling directly on to one of the hidden explosives). 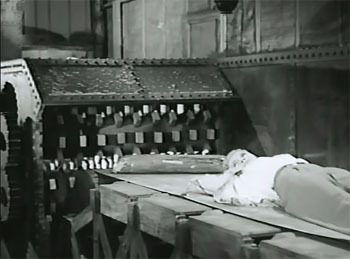 The Chapter Six motorboat-over-the-spillway cliffhanger is less distinctive, but is noteworthy due to its unusually clever resolution; other cliffhangers (the Chapter Three car crash, the Chapter Four rockfall in the mine shaft) are unobtrusively borrowed from earlier serials, but work just as effectively in their new framework. 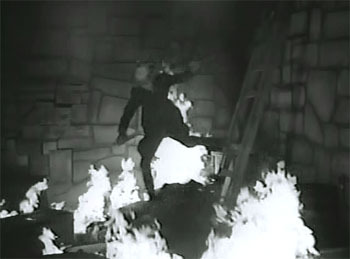 Above left: Tom Steele (doubling Larry Thompson) topples into the flames at the end of Chapter Seven. Above right: Helen Talbot appears to be headed into the shredder at the end of Chapter Nine. Forest Rangers’ cast is, unfortunately, an uneven one. 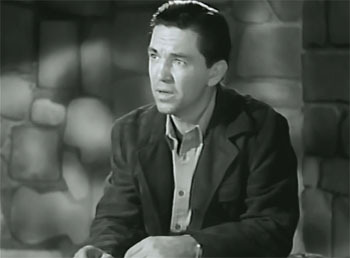 Star Larry Thompson was clearly cast for no other reason than his physical resemblance to Tom Steele; though he’s suitably tough and rugged in appearance, he’s unable to deliver dialogue with anything resembling energy or conviction, playing nearly every scene with the same bland half-smile and drawling, unemotional voice. The only time he manages anything approaching liveliness is during the scene where his character impersonates a crooked trapper, suggesting he’d have been more comfortable in a thuggish action-heavy role than an upright heroic one. 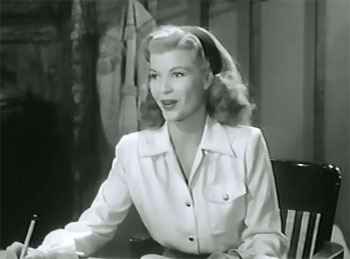 His leading lady–the cheerful, enthusiastic, and gracefully lovely Helen Talbot–easily diverts the audience’s attention from Thompson in all their shared scenes; her spirited but sweet screen personality does much to brighten up the good guys’ verbal interchanges, and makes it very easy to for the audience to feel concern for her frequently-imperiled character. 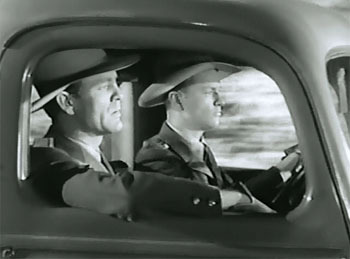 Above left: Larry Thompson is driven to a crime scene by Scott Elliott. Above right: Helen Talbot looking radiant. Stuart Hamblen, an accomplished country singer who acted in films on a sporadic basis, is horribly miscast as the scheming Professor Carver–a role that should have gone to someone like I. Stanford Jolley. Hamblen could be an excellent villain given the right part (see his first-rate turn as a vicious guerilla leader in the Roy Rogers film The Arizona Kid), but his extremely thick Texas accent and round, phlegmatic face are very poorly-suited to the part of a suave and cunning brains-heavy. He does his best to give a smugly threatening tone to his lines, but simply can’t look or sound sly and articulate enough to make his characterization credible. Anthony Warde, on the other hand, is in his element as Carver’s vicious henchman Spear; he sneers, snarls, and smirks with intimidating vigor as his character murders or attempts to murder all those standing in his boss’s way. Above left: Stuart Hamblen explains his plans. Above right: Anthony Warde makes a menacing entrance, flanked by henchman Carey Loftin. 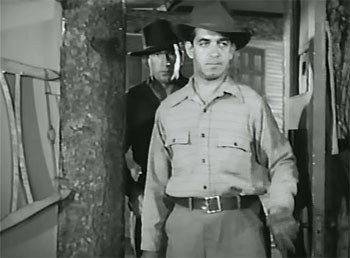 The supporting cast of Forest Rangers contains many solid character players, all of whom receive little enough screen time but make the most of their roles. Tom London is very good as the garrulous and cheerfully opinionated amateur archeologist whose murder sets the plot in motion; Ernie Adams is also enjoyably lively in his turn as a gambling-addicted rancher, and Leroy Mason is characteristically slick and sinister as the gambler who tries to cheat him. Silent-era leading lady Marin Sais appears briefly as the victim of the villains’ fake haunting, while Bud Geary delivers a hilarious, scene-stealing performance as her untrustworthy slob of a nephew. Republic mainstay Jack Kirk has a single scene as a farmer, Stanley Blystone is a crooked realtor, Wheaton Chambers a put-upon assayer, Walter Soderling the old crank who pontificates about the “spirits of the Towers,” and Rex Lease the Ranger who staffs the station office. Other Rangers are played by Scott Elliott, Jay Kirby, James Martin (whose line delivery is extremely amateurish), and a young Bob Wilke–who appears frequently throughout the serial as the Rangers’ fire-spotter. Charles Sullivan is a crooked bartender, and Buddy Roosevelt and Harry Strang are henchmen; the serial’s stuntmen all pop up as henchmen as well, with Van Sickel and Steele (as usual) playing multiple parts. King of the Forest Rangers is undeniably action-packed, fast-paced, and handsomely produced, and provides the viewer with plenty of solid excitement and entertainment. However, its dull leading man, its miscast brains heavy, and its writers’ poor development of their intriguing central premise combine to make it, overall, the least interesting Republic serial of its era. 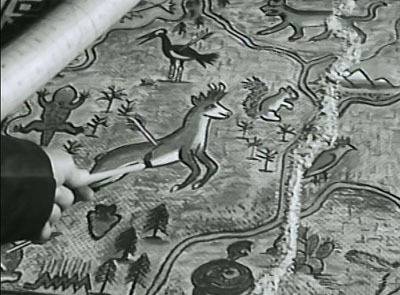 Above: Stuart Hamblen points out the key identifying marks on the ancient Indian tapestry that shows the locations of the towers. This entry was tagged Anthony Warde, Bud Geary, Ernie Adams, Fred C. Brannon, Helen Talbot, LeRoy Mason, Republic serials, Spencer Bennet, Tom London. Bookmark the permalink. While I agree with most of your review, I will just add that with all of these shortcomings,King of the Forest Rangers, is still head and shoulders above many of the chapter plays from Columbia and Universal. ’nuff said! The only part of your review I disagree with is saying KING OF THE FORREST RANGERS is the weakest of Republic’s early post-war serials. My choice for that honor goes to THE PHANTOM RIDER, which I thought needed a shot of adrenaline. King of the Forest Rangers definitely has more fistfights than The Phantom Rider (due to the cumbersome nature of the Rider’s mask), but I still consider Rider to be the better serial. Rider has a large and interesting cast of prominent supporting characters (King’s cast of principals is absolutely barebones), a vastly superior brains heavy (Leroy Mason), and a better hero (Robert Kent is not the most dynamic of leading men, but he’s a much better actor than Larry Thompson). 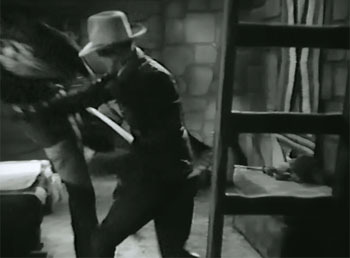 Also, the comparative scarcity of fistfights in Rider entails lots of outdoor chases and gun battles, and makes the action scenes seem better-balanced than in Forest Rangers (which could have afforded to drop about half-a-dozen of its indoor fight setpieces in favor of a few more clashes in the wilds of Big Bear Valley). Drop half a dozen Bennet fist fights? Never! LOL. THE PHANTOM RIDER had a couple of really dumb cliffhangers, especially the one with the shack built over the edge of a cliff. *** out of *****–Republic’s expertise at the action and cliffhanger scenes saves a serial with a flabby plot, a dull lead, and the worst main villain of any serial I have seen.